Monday December 13th 1897 I did sewing in the forenoon. In the afternoon Will helped me empty husks into a new mattress. It was not very cold today and snowed a little. I knit in the evening. Tuesday December 14th 1897 I got early dinner and we went to town in the cutter. I did some shopping for the christmas tree. We came home in good time. weather mild. Wednesday December 15th 1897 I was busy with the work most of the forenoon. I knitted a cotton tick in the afternoon and wrote in evening. Thursday December 16th 1897 weather very cold and stormy. I ironed my lace bed set and put the lining in again. Will worked all the afternoon painting chairs for me. I wrote in the evening. 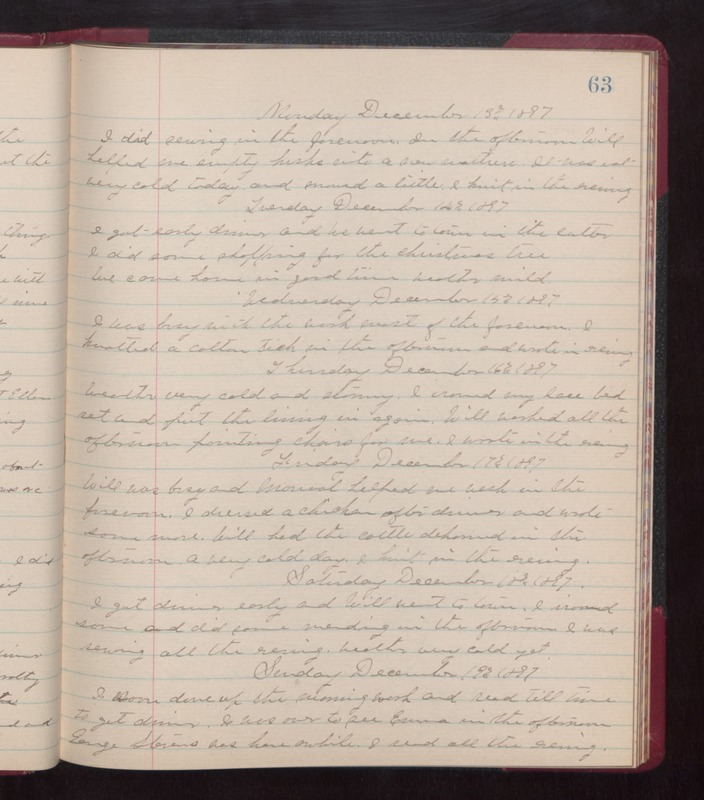 Friday December 17th 1897 Will was busy and Manuel helped me wash in the forenoon. I dressed a chicken after dinner and wrote some more. Will had the cattle dehorned in the afternoon. A very cold day. I knit in the evening. Saturday December 18th 1897 I got dinner early and Will went to town. I ironed some and did some mending in the afternoon. I was sewing all the evening. weather very cold yet. Sunday December 19th 1897 I soon done up the morning work and read till time to get dinner. I was over to see Emma in the afternoon. George Stevens was here awhile. I read all the evening.